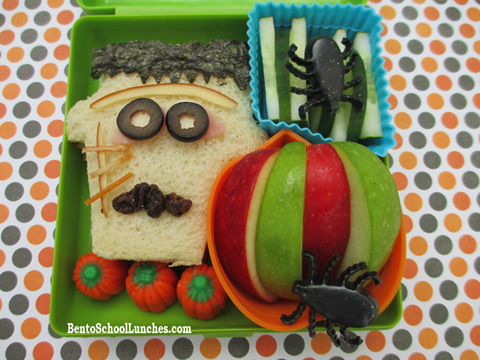 Soon it will be Halloween and you will be seeing more Halloween theme lunches from me. While I seldom include candies in his lunches, I do make exceptions for the holidays and special occasions. Free hand cut Monster shaped sandwich, nori hair, eyes are from sliced olives over smoked gouda cheese and ham, unibrow is from gouda cheese, scar is also from gouda cheese and raisins for mouth. Secured to sandwich with honey. Red and green apple slices. Thanks Michelle! :) I had a hard time spelling Frankenstein, lol, hopefully I'll not dream of him tonight! Brawhh-hahaha! (My best sinister laugh!! )This is wonderful Rina! Monsters need love to and I do love him! Great start of the Hallween season! Berrygirl, glad that you love him, hehehe! :) Halloween lunches are so fun to make and I am in the festive mood, starts from now till Christmas even being super busy at work (it is season time in FL).